A FRIEND OF MINE WAS ARRESTED IN ENGLAND AND FOUND GUILTY for a heinous crime. Was it robbery? Assault? Murder? Nope. None of those. Mike Stockwell got busted, along with his compatriot Michael Overd, for speaking the truth! 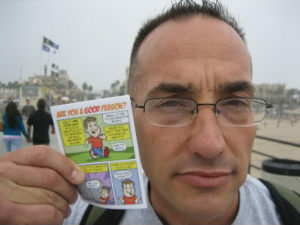 I met Mike Stockwell back in 2008 when I was leading a team for The Ambassador’s Academy, an evangelism ministry started by Ray Comfort that teaches normal Christians how to share their faith simply and biblically by handing out Gospel tracts, having personal conversations and by street preaching. I didn’t know it then, but Stockwell would continue to preach the gospel in streets around the country and the world as a calling and vocation for the next nine years. Jesus said, “Go into all the world and preach the good news”—and he obeyed! Now he’s paying the price. Preaching in the open air has been around since the beginning of time. God was actually the first open air preacher; in fact, he was the first “no-air” preacher. His first sermon? “Let there be light.” After him was Enoch, Noah, Joshua, Samuel, Elijah, Jonah, et al. After them, John the Baptizer, Jesus, Paul, Peter, and on and on and on. 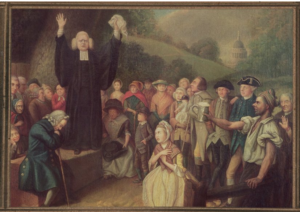 The first huge spiritual revival in America called “The Great Awakening” was largely brought about by “field preachers” such as George Whitefield, who is said to have preached over 18,000 sermons in the open air. The word “preach” comes from the Greek word, “kerusso,” which means to be a herald, one who proclaims openly the message of the king. It was an official position. 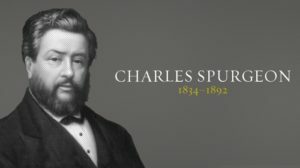 The herald was to preach loudly and openly so everyone could hear the message with gravity and authority that must be obeyed as an ambassador of the king. Get it? Street preachers have a message from the King. The main message being that God sent his Son to save sinners. You can reach more people in 10 minutes with the life-saving Gospel message by street preaching than in a month of one-to-one conversations. “The men were found guilty under Section 31 of the Crime and Disorder Act 1998 of using “threatening or abusive words or behaviour or disorderly behaviour within the hearing or sight of a person . . . and the offence was religiously aggravated.” Although last year British Prime Minister Theresa May said, “We must continue to ensure that people feel able to speak about their faith, and that absolutely includes their faith in Christ,”2 this is obviously not the case. The government prosecutor, Ian Jackson, said they were guilty of “intentionally alarming” the public with their open-air preaching. “To say to someone that Jesus is the only God is not a matter of truth. To the extent that they are saying that the only way to God is through Jesus, that cannot be a truth,” he argued. Jackson contended that Michael Stockwell and Michael Overd had crossed the line by stating that those not following Christ are on the broad path to destruction. [Stockwell preached that] people were on their way to Hell because of their failure to adopt the worldview of Christianity,” Jackson told the court. 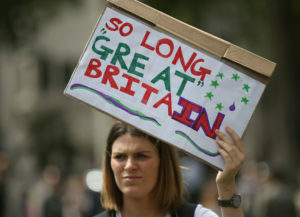 My, how far Britain has fallen since the days of Whitefield, Wesley and Spurgeon. 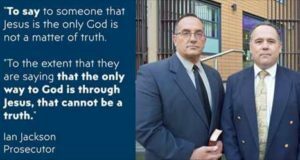 Please pray that they win their appeal. See Mike Stockwell sharing his faith with Frankenstein, yes, literally, Frankenstein, by clicking here. See Mike witnessing to angry, surly surfers by clicking here. See Mike evangelize unsuspecting volleyball players by clicking here.